By Jenna Jay. Doghouse Boxing's 'On the Ropes Boxing Radio' returns with Hostess Jenna Jay to discuss that the latest boxing news, hot topics and upcoming fights! 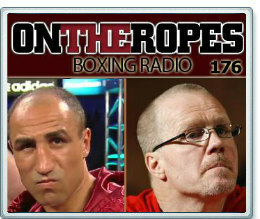 This week's 176th edition of the show features exclusive interviews with Hall of fame boxing trainer Freddie Roach and reigning WBO Super Middleweight champion Arthur Abraham. Just press play on the green player to listen to the show! (please allow 10-15 seconds to buffer) Be sure to tune in! • What's next for Abraham? Mikkel Kessler? • Where does he rank at Super Middleweight? • Will Freddie Roach and Amir Khan continue to work together? Click Play to listen to On The Ropes!